I’m a fountain pen guy but I’m a sucker for a new pointy device regardless of type. 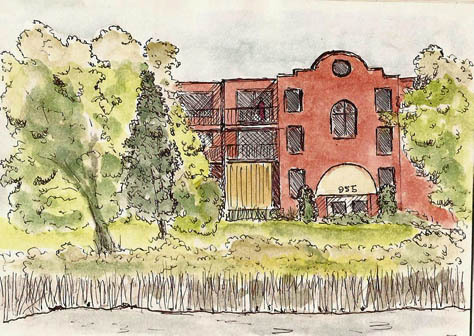 Pete Scully, a well-known urban sketcher swears by Uniball Signo UM-151 pens and uses them regularly. I’ve never found any of the fine tip versions in the stores around here but I finally decided to order a couple from Jet Pens. And I’m glad I did!! I’m a fan of Pilot’s Hitec-C3 and C4 pens as they’ve got very fine points, don’t wear down like the nylon-tip pens, and they have replacable cartridges. Unfortunately, they’re not waterproof so I can’t use them when I want to use watercolors with my pen/ink sketches. The Uniball Signo UM-151 pens, in .28 and .38 mm sizes solve that problem as their inks are pigment-based and thus are waterproof. I bought mine in ‘brown-black’ as I wanted a dark brown pen and haven’t been able to find a brown/waterproof fountain pen ink that makes me happy. I should say, up front, that I don’t understand Uniball’s tip dimensions except to say that the line width is less than the size of the tip, which is fine but it’s hard for me to report the actual line width for comparison to other pens. Mitsubishi, manufacturers of Uniball pens says that their .7mm pens produce a .4mm line. I couldn’t find a similar description of the .28 and .38mm pens. What I can say is that the .28mm line is significantly finer than that from a Micron 005, which is claimed to be .20mm. In any case, it’s fine…and when hatching a small sketch, it’s just dandy…or ‘peachy’ as my dad used to say. I’ve only had the pens a couple days so I can’t say much about long-term performance except to say that the rollerball should hold up better than the fine nylon tip pens, which I find wear down annoying fast. As replacement cartridges cost only $1.65 from Jet Pens, ink capacity isn’t much of a problem either. Here’s my first test drive of the pen. I used the .28mm on this tiny Rhodia pad (3×4). The pen doesn’t skip a beat. Stippling works better than I expected from a ball-tip pen, though if you stipple a lot, you need to roll it occasionally on a piece of scrap if the ball goes dry. Otherwise it’s a point-and-shoot device. 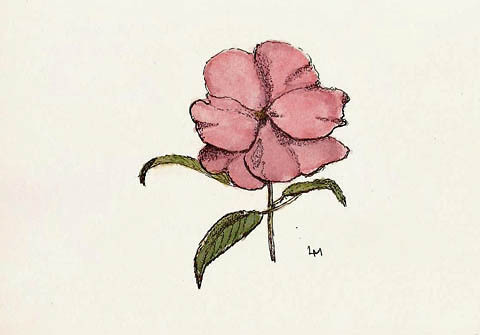 I was sitting on my porch, waiting to head out for a day of sketching in the country, and I used the Pilot Signo to draw this Impatiens flower in a Strathmore Series 400 “Drawing” sketchbook. Notice that even with the pink, there’s not bleed from the brown-black ink. Makes me very happy. These pens come in a bunch of colors and after seeing a couple sketched by Pete where he used the dark green, I can’t wait to get my hands on one of those. For myself, the .38mm is a better pen for sketching 5×8 or larger but the .28mm is a treat for details, hatching, and when you’re working small (eg – 3×5). Today I went out for an early morning walk along the river. 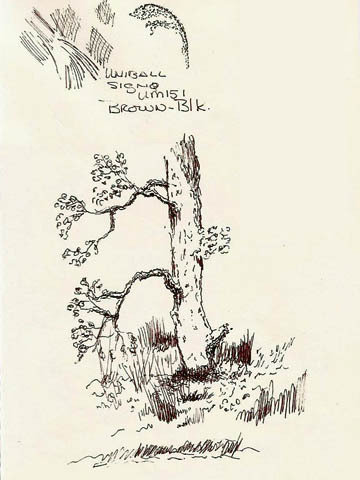 I sat down on a bench to watch a family of ducks and before you could say ‘fanatical sketcher’ I had my little Strathmore doodle book in hand and I was scribbling out this sketch with the Uniball UM-151-28 pen. It’s about 3×5 in size and all I had was a small waterbrush to add color. Given the small amount of time consumed on this quick sketch, I like the result and my new UM-151 pen. Glad you liked thesketch. It was done in a hurry but, like all sketches, it was fun. I’m with you on the cartridges. I hope you enjoy the blog. In a couple days I’ll post a larger sketch done with the UM-151 pen.